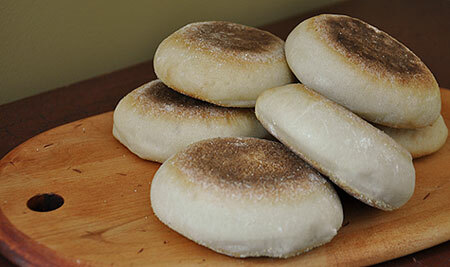 My husband loves these English muffins, so I try to always have some around. These are slightly different than the store versions because they are not sweetened and when you toast them up they retain a wonderful crunch on the bottom. If you like your English muffins to be slightly softer on the bottom then I suggest adding just a tablespoon of softened butter to enriched the dough. When I am making them to accompany eggs benedict I use the butter in the recipe. No one wants to try and saw through a crunchy bottom of an English muffin. They also freeze beautifully. I pre-slice them before freezing and then store them in a freezer bag for up to 2 months (if they can last that long). Combine the water, egg whites, flour, yeast, baking soda and salt in a medium sized bowl and mix until a rough dough forms. Turn out onto a lightly floured work surface and knead until it becomes smooth and silky 5-10 minutes. Place dough in an oiled bowl and cover with plastic wrap. Allow to rise until it has doubled in bulk, about 1 hour. Turn risen dough out onto a lightly floured surface and roll out to a ½ inch thickness. Allow the dough to rest for 5 minutes before cutting with a three inch cookie cutter. Place the cut circles on a light dusting of cornmeal. Cover with plastic wrap and allow to rest for 45 minutes to an hour. Preheat your oven to 350 degrees and preheat an electric griddle to 300 degrees or a fry pan on the stove on medium low heat. Lightly oil or butter the griddle. Place the muffins carefully onto the griddle. Griddle on one side for 4 minutes then flip and cook the second side for 4 minutes. Transfer to a baking sheet and place in the oven to finish cooking for about 4-6 minutes. Allow to cool completely before cutting, otherwise you will lose the nooks and crannies. I just made your English muffin recipe. My dough is rising right know; I had to add more flour cause it was really wet. Question: Do you beat the egg white or leave them liquid form? The dough is going to be extremely wet, that is what gives it the nooks and the crannies in the finished product. It is really hard to resist the urge to add extra flour to the recipe, but if you can you will be rewarded with a lighter muffin that has all those crevices to hold butter and jam. The egg white does not need to be beaten before being added to the dough, just straight in is good. I have seen other recipes where the egg white is beaten, but I haven’t found that it makes a difference in the final product. I think that it is just an extra unnecessary step. Thanks and Happy Baking! These look perfect! I’m going to try them :o) I’ve seen so many recipes where you either make a dough or a batter-like dough that’s poured into rings right on the griddle. This recipe sounds easy. Thanks for sharing. Thank you for this blog. That’s all I can say. You most definitely have made this blog into something thats eye opening and important. You clearly know so much about the subject, you’ve covered so many bases. Great stuff from this part of the internet. Again, thank you for this blog. Can your recipes be multiplied in bulk? Just opened a bakery and am looking for large scale special recipes… any tips?